A sharp, coppery emptiness rumbled deep within the creature's gut. Two full moons had come and gone since it had last fed, and its need was now overriding. Desperate. Before it, an invisible cone of fear swept the warm, shallow sea clean of life. Shoals of hake and tilefish panicked at its coming, scattering like handfuls of flung metallic spears. At a length of 50 feet (15 metres) and a mass of over 52 tons (47 tonnes), it would take more than a mere morsel to satisfy the megalodon. The enormous shark needed food - big food. A marlin circled lazily to the Megalodon's left, its barred ultramarine flanks glittering in the flickering shafts of late afternoon sunlight. Capable of mind-stuttering bursts of speed, it was too hard to catch for the shark to bother with. But still Megalodon's hunger burned. Skulking silently along the bottom, the megalodon caught a glimpse of a whale rising gently to the surface to ventilate its lungs. It was a cetothere, slow-moving and about 30 feet (10 metres) long: perfect. But the whale would only be vulnerable for a few moments, as it recovered from its most recent dive. As the whale drew in fresh air to replenish its spent supply, megalodon continued its stalk. Closer . . . closer . . . NOW!! The shark pumped its tail powerfully from side-to-side, accelerating rapidly to close the distance between it and the fuel its cells so urgently needed. The Megalodon's jaws gaped wide, revealing triangular, serrated teeth the size of a man's hand. Oxygen-bearing water pounded through its gills exhilaratingly. The Megalodon's upper jaw, slung loosely under its skull like that of other sharks, protruded forward and down: reaching, straining in anticipation of sweet, warm flesh . . .
Megalodon is by far the most celebrated and contentious of extinct sharks. Best known for its spectacular fossil teeth, broadly triangular and up to 7 inches (18 centimetres) long, Megalodon is the stuff of which legends are made. Virtually everyone who has ever gazed upon even a moderate-sized megalodon tooth has found it impossible to resist imagining what the rest of the fish might have looked like. And paleontologists have found it difficult to resist constructing theories about how this enormous shark may be related to the modern Great White. 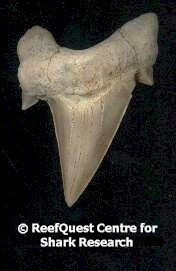 The fossil teeth of megalodon are very similar in over-all form to those of the living White Shark. Many people - professional paleontologists and amateur fossil collectors alike - have long assumed this similarity indicates a close evolutionary relationship between these two species. But the teeth of Megalodon show some notable differences from those of the White Shark: they are much thicker, resembling a broad 'D' in cross-section; the serrations are much smaller and more regular; and there is a dark, chevron-shaped region, called a "bourlette", between the rough root and the smooth blade (such a bourlette does not occur in the teeth of Carcharodon carcharias). Paleontologist Michael D. Gottfried and his co-workers have argued that these differences (with the exception of the bourlette) become less pronounced when Megalodon teeth are compared with the very largest white shark teeth. Gottfried suggests that by extrapolating tooth changes known to occur in the modern white shark, very megalodon-like teeth would result. Critics remain unconvinced. (? 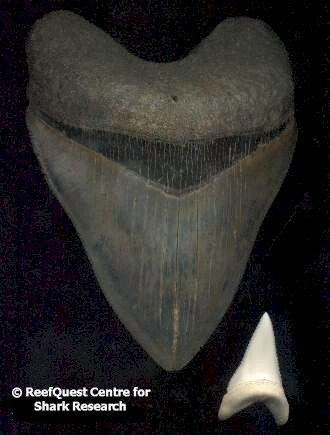 megalodon), left, and a recent tooth of the modern White Shark (Carcharodon carcharias), right. The genus used for Megalodon depends upon what one makes of their apparent differences. Due to the ambiguous suite of similarities and differences, the relationship of Megalodon to the modern White Shark is hotly contested. There are two basic schools of thought on the matter. One interprets the similarities to be due to shared ancestry, placing Megalodon in the same lineage as the White Shark. Proponents of this view believe that - like the extant lamnids - Megalodon probably evolved more-or-less directly from Cretolamna and feel strongly that it should be classified in the same genus and family as the modern White Shark (Carcharodon and Lamnidae, respectively). The other school interprets the similarities between the teeth of Megalodon and those of the White Shark as due to convergence, and therefore regards Megalodon as representing a separate lineage from that which produced the modern lamnids, including the White Shark. Proponents of this view believe that Megalodon evolved from Cretolamna via the Otodus lineage, and feel strongly that it should be classified in the genus Carcharocles as part of the family Otodontidae. Further, the Carcharocles cartel remains unconvinced that the modern lamnids derived from Cretolamna; David Ward has suggested that Isurolamna may be a more likely ancestral candidate for at least the Carcharodon-Isurus lineage. The battle lines between these opposing viewpoints are firmly drawn, and it does not appear that a consensus will be reached anytime soon. At present, there is simply not enough fossil lamnoid material to permit a firm resolution of the Carcharodon-Carcharocles debate. However, for all the contention over the correct genus to assign to Megalodon, most paleontologists agree on three main points: Megalodon was a relatively recent species, appearing in the fossil record only about 16 million years ago and disappearing suddenly about 1.6 million years ago; Cretolamna appendiculata is most likely an ancestor of Megalodon; and that Megalodon is not a direct ancestor of the modern White Shark, more like a great uncle or aunt. While the origin and interrelationships of Megalodon remain important paleoichthyological issues, uncertainty about which genus to use does not dissuade us from wondering what this giant shark was like in life.